The feudal Japan timeline starts in 1185, which was the year that ended the Heian period. This was when the Japanese government was operated by those in the military class. The feudal era of Japan consisted of four main periods, the Kamakura period, Muromachi period and Azuchi Momoyama period and Edo period. Although, the Emperor was technically at the top of the chain during the feudal period of Japan, in reality, the shogun had more political power and they were the ones who really controlled the country. The military approach of running the country led to many notable events in the feudal period in Japan. For example, there were many civil wars and invasion attempts throughout the era. 1185 – Taira Clan was defeated by Minamoto Clan in the Genpei War, also known as Genpei Gassen. This marks the end of Heian period. 1192 – Minamoto Yoritomo established Kamakura Shogunante in the city of Kamakura, and marks the beginning of the Kamakura Period, which was the true beginning of feudalism in Japan. 1193 – Yorimoto gets his brother Noriyori assassinated as he becomes suspicious. Noriyori was the Heian period general and fought in Genpei War along with his brothers. 1199 – The Kamakura bakufu’s first shogun, Minamoto Yoritomo dies. 1274 – The Mongols’ first attempt to invade Japan, also known as Bunei War. The invasion attempt fails due to the storm. Following the event, the Mongols escaped to Korea. 1281 – The Mongols’ second Japanese invasion attempt. Again, due to the bad weather condition, this was unsuccessful. 1293 – Kamakura is hit by a large earthquake and tsunami, leading to the death of over 20,000 people. 1333 – Kamakura Shogunate is destroyed by Nitta Yoshisada, and this ends the Kamakura period. 1334 – Kemmu Restoration – this was when the Emperor regained political power, which was short lived. 1336 – Ashikaga Takauji captures the city of Kyoto and ends the Emperor Go-Daigo’s attempt to restore imperial rule. 1337 – The Emperor flees to Kyushu. 1338 – Ashikaga Takauji becomes the first Muromachi shogun. This was the establishment of Muromachi Shogunate, also known as Ashikaga Shogunate. 1392 – Southern and Northern courts are reunited. 1450 – Hosokawa Katsumoto builds Ryoanji, a zen temple in Kyoto. Ryoanji is famous for its traditional Japanese zen dry garden. 1467 – The Onin War (Onin no Ran) begins. This was a civil war between Yamana Sozen and Hosokawa Katsumoto, which involved a large number of daimyos and samurais in all parts of Japan. 1477 – The Onin War ends. 1542 – Firearms are introduced to Japan by the Portuguese traders. 1546 – Ashikaga Yoshiteru becomes the shogun. 1549 – Saint Francis Xavier arrives in Kyushu in order to introduce Christianity to Japan. 1555 – Battle of Miyajima. A civil war that took place on the island of Miyajima. 1560 – Battle of Okehazama. Oda Nobunaga defeates Imagawa Yoshimoto. 1568 – Nobunaga occupies Kyoto. Furthermore, Christianity is permitted by Oda Nobunaga. 1568 – The beginning of Azuchi Momoyama period. 1569 – Oda Nobunaga improves vicil administration by issuing regulations governing currency. 1570 – Battle of Anegawa – where the teamed up Oda Nobunaga and Tokugawa Ieyasu defeat Azai and Asakura Clans. 1573 – The end of the Muromachi Bakufu. After this event, there was no shogun for 30 years. 1575 – Battle of Nagashino. 1582 – Honno-ji incident – Oda Nobunaga is forced to commit suicide following Akechi Mitsuhide turned on him. Mitsuhide was believed to have said “The enemy awaits at Honno-ji”, where Oda Nobunaga was based. 1582 – Oda Nobunaga’s oldest son, Oda Nobutada is also attacked by Akechi Mitsuhide, which leads to Nobutada’s suicide. 1582 – Battle of Yamazaki – , Toyotomi Hideyoshi allied with the Mori clan to defeat Akechi Mitsuhide, revenging his lord, Oda Nobunaga. 1584 – Battle of Komaki and Nagakute – a series of battles between Toyotomi Hideyoshi and Tokugawa Ieyasu. 1586 – Toyotomi Hideyoshi builds Osaka Castle. 1592 – Toyotomi Hideyoshi’s first Korean invasion attempts, which failed. 1597 – Toyotomi Hideyoshi’s second attempt to invade Korea, which was also unsuccessful. 1598 – Toyotomi Hideyoshi dies. 1600 – Battle of Sekigahara – Tokugawa Ieyasu wins the battle and establishes Tokugawa bakufu, ending the Azuchi Momoyama period. 1603 – The beginning of the Edo period – Tokugawa Ieyasu becomes the first Edo shogun. 1614 – Tokugawa Ieyasu bans Christianity in Japan, leading churches in Japan to be destroyed and missionaries were imprisoned. 1615 – Tokugawa Ieyasu defeats the Toyotomo clan in Osaka Castle. 1616 – The death of Tokugawa Ieyasu. 1623 – Tokugawa Iemitsu becomes the shogun. 1638 – Tokugawa Iemitsu bans Portuguese traders. 1641 – Tokugawa Iemitsu bans all foreigners from Japan, apart from Chinese and Dutch who were restricted to Deshima. 1701 – 47 Ronin Incident – a daimyo is killed by 47 ronins in revenge of their master daimyo. 1792 – Adam Laxman, a Russian envoy arrives in Japan. 1804 – The Russians’ attempt to establish trade relations with Japan fails. 1854 – The USA commander Matthew Perry arrives in Edo and signs a trade agreement. 1860 – The first Japanese embassy opens in the USA. 1868 – Meiji Restoration – Tokugawa Yoshinobu resigns, and the Emperor regains power. This was the end of the Edo period and the beginning of the Meiji Period. 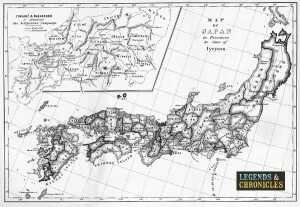 A map of the regions in the feudal Japan timeline. The 700 year feudal Japan period consisted of a lot of major events as listed in the timeline above. This fearsome yet exciting period plays a significant role in the history of Japan and what’s more, worldwide today.